Florists seem to be one of the vendors brides leave last to meet with. While, flowers might not seem as important to your day as the dress, photographer or caterer, they are extremely significant because they provide the soft, sweet color that brightens your event. The details make your wedding memorable and flowers are the easiest detail to start with. I hear over and over, “What do flowers cost? I just don’t know where to begin with my budget?” So, here are a few tips to help you plan. 1. If you wait to meet with your florist last, chances are you will not have room in your budget anymore for the look you want. Don’t wait until your money has been used up elsewhere and get a quote within the first three weeks of planning so you can accommodate for cost and the rest of your budget. 2. Don’t set you heart on a centerpiece you pinned on Pinterest. While Pinterest is a great tool to help you get ideas and communicate with your florist on what you like, it can be deceiving. You might fall in love with a centerpiece that costs $200.00 each. If you have 20 tables, your reception work alone will be $4,000.00, which could be way out of your price range. 3. Be cautious of a big bridal party. Each bridesmaid you add to your line up will increase the cost of flowers. 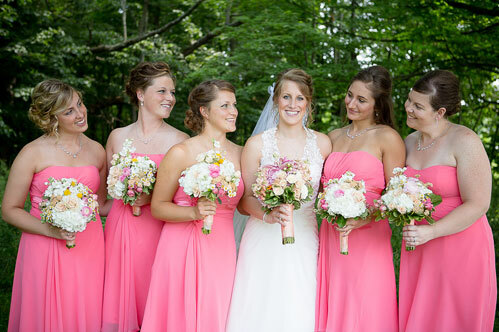 Bridal parties with 4 or 5 attendants are a lot more manageable than 8 or higher. 4. Remember each flower has a peak season. If you love peonies, expect your wedding to fall in May or June. If you set your heart on a specific flower but your wedding is outside of their growing season, prices are going to rise or they might not even be available. 5. 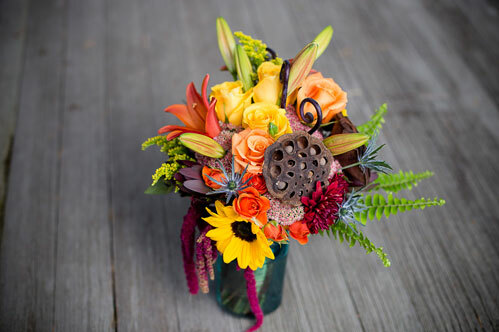 Communicate with your florist. What is more important, the type of flower or your color scheme? To stay cost friendly, tell them what colors you are and they can give you ideas for your season. 6. Specific flowers cost more than others. Calla lilies can be up to $10 a stem where daises can cost $3.00 for an entire bunch. Decide where you would like to fall and what you can afford. 7. Remember florists can always come down in price or alter your quote to fall within your budget. Start with your dream wedding. Find out how much that will cost and work down from there. They may need to substitute types of flowers for others but the same concept and look will be maintained. 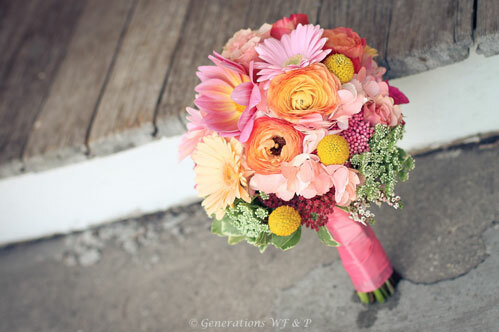 Generations Wedding Flowers & Photography is a mama-daughter team based out of Southern Wisconsin. Our passion for botany and photography stemmed from my grandmother who started us out. I currently am planning my own fall 2015 wedding which has been so much fun! My favorite flower is peach stock and my mom’s (Patty) are green roses.